Cincinnati is the city where professional baseball was first played. In 1869, The Cincinnati Red Stockings became the first professional baseball team. They went 65-0 in their first season but were disbanded after the 1870 season because the team owner thought the players were making too much money. I can't imagine what A.P.C. Bonte would say of player salaries today. Former players and management formed the Boston Red Stockings in 1871 and 10 years later, the Cincinnati Red Stockings team was revived with new management. The Boston team changed its name to the Braves and then moved to Milwaukee in 1953 and then Atlanta in 1966. The Boston Red Sox team that is in Boston now was started in 1901 and their original name was the Boston Americans. Great American Ballpark contains a great many references to Reds teams of the past, including an extensive Hall of Fame that encircles part of the ballpark and mosaics showing championship-winning teams. Another historical reference in the ballpark is the two smokestacks in the right field concourse. The stadium sits on the Ohio River and when viewed from a certain angle, the smokestacks look like they could be from a steamship on the Ohio River – a very common thing in the 19th century. After an opposing player strikes out, the stacks emit fire. The Reds dominated the Blue Jays 11-1 and Mike Leake threw a gem. The smoke stacks emitted fire six times over Leake's eight innings. Reliever Carlos Contreras pitched the ninth and ended the game with another K.
Final Score: Reds 11, Blue Jays 1. Before the gates open at Great American Ballpark, Jackson, 3, high fives Alex after they played a game of imaginary catch. 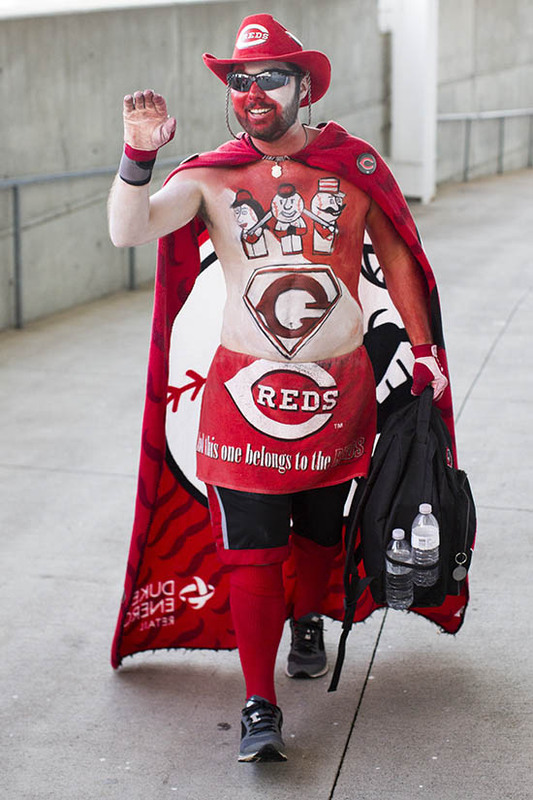 It takes Tom Grabo about two hours to dress up for a Reds game, something he has done more than 50 times in the past two seasons. "I was only going to do it a few times but I saw how much the kids loved it so I kept doing it," he said. Fans walk on the 100 level concourse. From right, stilted jugglers Adam and Brian of the Cincinnati Circus Company walk from one outfield section to another. Grandson and grandfather. Permission to photograph given, but names were not. Overhead at Great American Ballpark. The folks facing to the right are queuing to leave the stadium via the re-entry line. Cincinnati is one the few stadiums that allows re-entry. Reds pitcher Mike Leake throws to first on a weakly hit ground ball. Fans look up as a batting practice home run enters the bleachers. Dan. 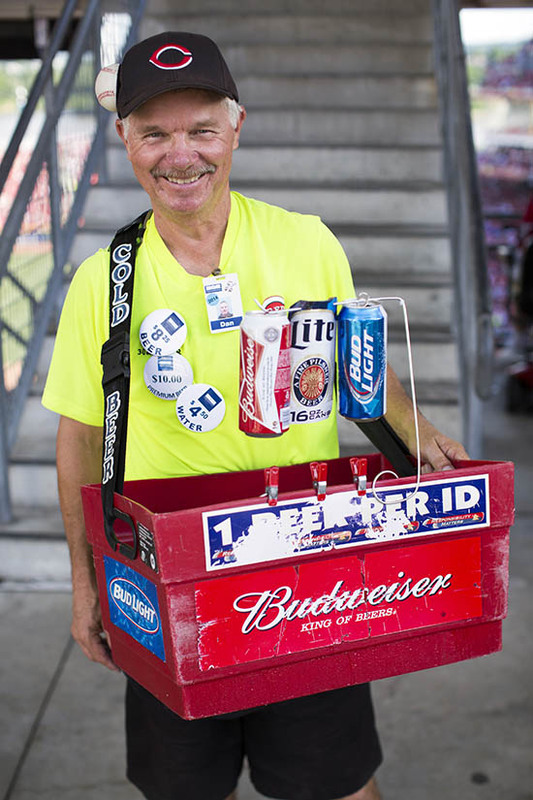 Beer vendor for five years. Colby Rasmus strikes out to end the game.